NASA’s LADEE lunar orbiting dust and atmosphere explorer probe has bitten the dust and crashed into the Moon’s surface exactly as planned following a fabulously successful and groundbreaking science mission that exceeded all expectations. The Lunar Atmosphere and Dust Environment Explorer (LADEE) spacecraft impacted the far side of the Moon sometime overnight between 12:30-1:22 a.m. EDT, Friday, April 18 (9:30 and 10:22 p.m. PDT, Thursday, April 17) according to a NASA statement. Running low on fuel and unable to continue any further science observations, the couch sized spacecraft was intentionally plunged into the rugged lunar surface at a spot designed to keep it far away from disturbing any of the historic Apollo manned lunar landing sites or unmanned surveyors on the Moon’s near side. Mission controllers at NASA’s Ames Research Center allowed LADEE’s orbit to naturally decay following the conclusion of the probes extended mission in the final low orbit science phase. The probe was likely smashed violently to smithereens and mostly vaporized from the heat generated upwards of several hundred degrees. Any surviving debris may be buried in shallow crater formed by the impact. “At the time of impact, LADEE was traveling at a speed of 3,600 miles per hour – about three times the speed of a high-powered rifle bullet,” said Rick Elphic, LADEE project scientist at Ames, in a NASA statement. The powerful NAC telescopic camera aboard NASA’s still orbiting Lunar Reconnaissance Orbiter (LRO) will be directed in coming months to try and photograph the impact site after engineers pinpoint the likely crash site. LRO has already imaged LADEE while both were co-orbiting in different lunar orbits. After completing its primary science mission in March, the already ultra low altitude of the lunar orbiting probe was reduced even further so that it was barely skimming just 2 kilometers (1 mile) above the pockmarked lunar surface. Such a low altitude thus enabled LADEE to gather unprecedented science measurements of the Moon’s extremely tenuous atmosphere and dust particles since the species would be present at a higher concentration. Lots of fuel is required to maintain LADEE’s orbit due to the uneven nature of the Moon’s global gravity field. The final engine firing was commanded on April 11 to ensure a far side impact and the safety of all the historic lunar landing sites. LADEE was launched on Sept. 6, 2013 from NASA Wallops in Virginia on a science mission to investigate the composition and properties of the Moon’s pristine and extremely tenuous atmosphere, or exosphere, and untangle the mysteries of its lofted lunar dust dating back to the Apollo Moon landing era. All those objectives and more were accomplished during its nearly half year investigating Earth’s nearest neighbor. It entered lunar orbit on Oct. 6, 2013 amidst the ridiculous government shutdown that negatively affected a number of science missions funded across the US federal government. NASA granted LADEE a month long extension since the residual rocket fuel was more than anticipated due to the expertise of LADEE’s navigation engineers and the precision of the launch atop the Orbital Sciences Minotaur V rocket and orbital insertion. The 844 pound (383 kg) robot explorer was assembled at NASA’s Ames Research Center, Moffett Field, Calif., and is a cooperative project with NASA Goddard Spaceflight Center in Maryland. Stay tuned here for Ken’s continuing LADEE, Chang’e-3, Orion, Orbital Sciences, SpaceX, commercial space, Mars rover and more planetary and human spaceflight news. A pair of NASA spacecraft orbiting Earth’s nearest celestial neighbor just experienced a brief ‘Close Encounter of the Lunar Kind’. Proof of the rare orbital tryst has now been revealed by NASA in the form of spectacular imagery (see above and below) just released showing NASA’s recently arrived Lunar Atmosphere and Dust Environment Explorer (LADEE) lunar orbiter being photographed by a powerful camera aboard NASA’s five year old Lunar Reconnaissance Orbiter (LRO) – as the two orbiters met for a fleeting moment just two weeks ago. See above a dissolve animation that compares the LRO image (geometrically corrected) of LADEE captured on Jan. 14, 2014 with a computer-generated and labeled LADEE image. All this was only made possible by a lot of very precise orbital calculations and a spacecraft ballet of sorts that had to be nearly perfectly choreographed and timed – and spot on to accomplish. Both sister orbiters were speeding along at over 3600 MPH (1,600 meters per second) while traveling perpendicularly to one another! So the glimpse was short but sweet. LADEE flies in an equatorial orbit (east-to-west) while LRO travels in a polar orbit (south-to-north). LADEE achieved lunar orbit on Oct. 6, 2013 amidst the federal government shutdown. Thus their orbits align only infrequently. The LRO orbiter did a pirouette to precisely point its high resolution narrow angle camera (NAC) while hurtling along in lunar orbit, barely 5.6 miles (9 km) above LADEE. And it was all over in less than the wink of an eye! LADEE entered LRO’s Narrow Angle Camera (NAC) field of view for 1.35 milliseconds and a smeared image of LADEE was snapped. LADEE appears in four lines of the LROC image, and is distorted right-to-left. Both spacecraft are tiny – barely two meters in length. “Since LROC is a pushbroom imager, it builds up an image one line at a time, thus catching a target as small and fast as LADEE is tricky!” wrote Mark Robinson, LROC principal investigator of Arizona State University. So the fabulous picture was only possible as a result of close collaboration and extraordinary teamwork between NASA’s LADEE, LRO and LROC camera mission operations teams. LADEE passed directly beneath the LRO orbit plane a few seconds before LRO crossed the LADEE orbit plane, meaning a straight down LROC image would have just missed LADEE, said NASA. Therefore, LRO was rolled 34 degrees to the west so the LROC detector (one line) would be precisely oriented to catch LADEE as it passed beneath. “Despite the blur it is possible to find details of the spacecraft. You can see the engine nozzle, bright solar panel, and perhaps a star tracker camera (especially if you have a correctly oriented schematic diagram of LADEE for comparison),” wrote Robinson in a description. See the LADEE schematic in the lead image herein. LADEE was launched Sept. 6, 2013 from NASA Wallops in Virginia on a science mission to investigate the composition and properties of the Moon’s pristine and extremely tenuous atmosphere, or exosphere, and untangle the mysteries of its lofted lunar dust. Since LADEE is now more than halfway through its roughly 100 day long mission, timing was of the essence before the craft takes a death dive into the moon’s surface. You can see a full scale model of LADEE at the NASA Wallops visitor center, which offers free admission. LRO launched Sept. 18, 2009 from Cape Canaveral, Florida to conduct comprehensive investigations of the Moon with seven science instruments and search for potential landing sites for a return by human explorers. It has collected astounding views of the lunar surface, including the manned Apollo landing sites as well as a treasure trove of lunar data. In addition to NASA’s pair of lunar orbiters, China recently soft landed two probes on the Moon. So be sure to read my new story detailing how LRO took some stupendous Christmas time 2013 images of China’s maiden lunar lander and rover; Chang’e-3 and Yutu from high above- here. KENNEDY SPACE CENTER, FL – NASA’s Lunar Atmosphere and Dust Environment Explorer (LADEE) has descended to its planned low altitude orbit and begun capturing science data on its ground breaking mission to study the Moon’s ultra tenuous atmosphere and dust using a spacecraft based on a revolutionary new design aimed at speeding development and cutting costs. LADEE set sail for Earth’s nearest neighbor during a spectacular night time launch atop the maiden flight of an Air Force Minotaur V rocket on Sept. 6 from NASA’s Wallops Island launch facility on Virginia’s Eastern shore. The flawless launch thrilled spectators up and down virtually the entire US East coast region and yielded many memorable snapshots. Following a month long voyage and three and a half long looping orbits of the Earth, LADEE successfully fired its main engine for 4 minutes and 12 seconds on Oct. 6 and successfully entered lunar orbit, Dawn McIntosh, LADEE deputy project manager at NASA Ames Research Center, told Universe Today in an exclusive interview. A series of engine firings over the past month gradually circularized and lowered LADEE into its final science orbit around our Moon while engineers checked out the spacecraft during the commissioning phase of the mission. The do or die initial Lunar Orbit Insertion burn (LOI-1) allowed LADEE to be captured into a highly elliptical, equatorial lunar orbit, said McIntosh. “Two additional LOI burns on Oct. 6 and Oct 9 lowered LADEE to an approximately 4 hour orbit with a periapsis altitude of 234 Kilometers (km) and apoapsis altitude of 250 km” McIntosh told me. The trio of LOI main engine firings used up most of LADEE’s precious on board fuel. “LADEE launched with 134.5 kilograms (kg) of fuel. Post LOI-3, 80% of our fuel has been consumed,” said McIntosh. Its flying at an extremely low altitude ranging from merely eight to 37 miles (12-60 kilometers) above the moon’s surface. By circling in this very low altitude equatorial orbit, the washing machine sized probe will make frequent passes crossing from lunar day to lunar night enabling it to precisely measure changes and processes occurring within the moon’s tenuous atmosphere while simultaneously sniffing for uplifted lunar dust in the lunar sky. The remaining fuel will be used to maintain LADEE’s orbit during the approximately 100 day long science mission. The mission length is dictated by the residual fuel available for thruster firings. The purpose of LADEE is to collect data that will inform scientists in unprecedented detail about the ultra thin lunar atmosphere, environmental influences on lunar dust and conditions near the surface. In turn this will lead to a better understanding of other planetary bodies in our solar system and beyond. “A thorough understanding of the characteristics of our lunar neighbor will help researchers understand other small bodies in the solar system, such as asteroids, Mercury, and the moons of outer planets,” said Sarah Noble, LADEE program scientist at NASA Headquarters in Washington. By studying the raised dust, scientists also hope to solve a 40 year old mystery – Why did the Apollo astronauts and early unmanned landers see a glow of rays and streamers at the moon’s horizon stretching high into the lunar sky. LADEE arrived at the Moon last month in the midst of the US government shutdown – which negatively impacted a host of other NASA missions. Only a ‘skeleton crew’ was available. “All burns went super well,” Worden told me. And he is extremely proud of the entire team of “dedicated” professional men and women who made it possible during the shutdown. “It says a lot about our people’s dedication and capability when a skeleton crew’ can get a new spacecraft into lunar orbit and fully commissioned in the face of a shutdown!” Worden said to Universe Today. Now the real science begins for LADEE and the team. NASA’s new LADEE spacecraft successfully entered lunar orbit, is operating beautifully and has begun shooting its radical laser communications experiment despite having to accomplish a series of absolutely critical do-or-die orbital insertion engine firings with a “skeleton crew ” – all this amidst the NASA and US government shutdown, NASA Ames Research Center Director Pete Worden told Universe Today in a LADEE mission exclusive. During the two and a half week long NASA shutdown, engineers had to fire LADEE’s maneuvering thrusters three times over six days – first to brake into elliptical orbit about the Moon and then lower it significantly and safely into a circular commissioning orbit. “All burns went super well,” Ames Center Director Worden told me exclusivly. And he is extremely proud of the entire team of “dedicated” professional men and women who made it possible during the shutdown. “It says a lot about our people’s dedication and capability when a skeleton crew can get a new spacecraft into lunar orbit and fully commissioned in the face of a shutdown!” Worden said to Universe Today. After achieving orbit, a pair of additional engine burns reduced LADEE’s altitude and period into its initial commissioning orbit and teams began the month long activation and instrument checkout phase. “We are at the commissioning orbit of 250 km,” said Worden. And to top all that off, LADEE’s quartet of science instruments are checked out and the ground – breaking laser communications experiment that will bring about a quantum leap in transmitting space science data has already begun its work! “We’ve begun the Lunar Laser Communications Demonstration (LLCD) tests and its working very well,” Worden explained. And that’s the whole point of the LADEE mission in the first place. 97% of NASA’s employees were furloughed during the utterly chaotic and wasteful partial shutdown of the US government that lasted from Oct. 1 to Oct. 17 and also temporarily threatened the upcoming launch of NASA’s next mission to Mars – the MAVEN orbiter. However, orbital mechanics follows the natural laws of the Universe, continues unabated and waits for no one in Washington, D.C.
NASA’s Jupiter-bound Juno orbiter also flew by Earth amidst the DC shutdown showdown on Oct. 9 for a similarly critical do-or-die gravity assisted speed boost and trajectory targeting maneuver. The stakes were extremely high for NASA’s Lunar Atmosphere and Dust Environment Explorer (LADEE) mission because the spacecraft was on course for the Moon and absolutely had to ignite its main engine on the Sunday morning of Oct. 6. There were no second chances. If anything failed, LADEE would simply sail past the Moon with no hope of returning later. So, mission controllers at NASA Ames commanded LADEE to ignite its main engine and enter lunar orbit on Oct. 6 following the spectacular Sept. 6 night launch from NASA’s Wallops Island spaceport in Virginia. The approximately four minute long burn know as Lunar Orbit Insertion burn 1 (LOI-1) began with LADEE’s arrival at the Moon following three and a half long looping orbits of the Earth. LOI-1 changed the spacecrafts velocity by 329.8 meters/sec so that the couch sized probe could be captured by the Moon’s gravity and be placed into a 24 hour polar elliptical orbit. The LOI-2 maneuver on Oct. 9 put LADEE into a 4-hour elliptic lunar orbit. The third and final LOI-3 burn occurred on Oct. 12, and put the spacecraft into the 2-hour commissioning orbit (roughly 235 Km x 250 Km), according to a NASA statement. “LADEE is the first NASA mission with a dedicated laser communications experiment,” said Don Cornwell, mission manager for the Lunar Laser Communications Demonstration (LLCD), NASA’s Goddard Space Flight Center, Greenbelt, Md, during an interview with Universe Today at the LADEE launch. “With the LLCD experiment, we’ll use laser communications to demonstrate at least six times more data rate from the moon than what we can do with a radio system with half the weight and 25 percent less power,” said Cornwell. The LLCD will be operated for about 30 days during the time of the commissioning orbit period. Update Oct 6: LADEE fired its main engine this morning (Oct. 6) at 6:57 a.m. EDT and successfully achieved lunar orbit. Headline/story revised. NASA’s trailblazing LADEE lunar spacecraft is set to ignite its main engine and enter lunar orbit on Sunday morning, Oct. 6 – if all goes well – following the spectacular Sept. 6 night launch from NASA’s Virginia spaceport. And in a happenstance no one could have foreseen, the critical engine firing comes smack in the midst of the political chaos reigning in Washington D.C. that has shut down the US government, furloughed 97% of NASA’s employees, and temporarily threatened the upcoming launch of NASA’s next mission to Mars – the MAVEN orbiter. However, orbital mechanics waits for no one! A source indicated that LADEE (Lunar Atmosphere and Dust Environment Explorer) mission operations were continuing leading up to the engine burn. But there will be virtually a complete news blackout and little public information released due to the legal requirements of the shutdown. NASA websites, which are amongst the most heavily trafficked, as well as NASA TV have been shuttered during the shutdown and the press office is likewise furloughed. So it was do or die for LADEE with the four minute long braking thruster firing set to start on Oct. 6 at 6:57 a.m. EDT (10:57 UTC), so that the couch sized spacecraft is captured by the Moon’s gravity. Fortunately, LADEE was deemed “essential” and a small team of engineers is working right now at mission control at NASA’s Ames Research Center in California. If the had burn failed, LADEE will swing by the moon with no hope of returning. And this is being accomplished with a skeleton crew thanks to the government shutdown. Video caption: This video shows the LADEE lunar orbit capture scheduled to take place at 10:57 UTC on 6 Oct. 2013. The main view is an Earth centered perspective showing the effect of the Moon’s gravity on the orbit and then how a Lunar orbit looks from the Earth. The inset view shows the same trajectory from the perspective of the Moon. Dubbed LOI-1 (Lunar Orbit Insertion burn 1),it is designed to begin with LADEE’s arrival at the Moon after three and a half orbits of the Earth. It will change the spacecrafts velocity by 329.8 meters/sec. LOI-1 is the first of three main engine maneuvers and will place LADEE into a 24 hour retrograde orbit, with a periselene altitude of 590 km (369 mi). LOI-2 follows on Oct. 9 to place LADEE into a 4 hour orbit with a 250 km (156 mi) periselene altitude. Finally LOI-3 on Oct. 12 places LADEE into a roughly circular 250 km (156 mi) orbit that initiates a 30 day commissioning phase as well as experiments using the on-board Lunar Laser Communications Experiment (LLCD) before the start of the missions science phase. LADEE thundered to space atop the maiden launch of the five stage Minotaur V rocket on Sept. 6, blazing a spectacular trail to orbit from a beachside launch pad at NASA’s Wallops Flight Facility in Virginia. The blastoff was easily visible to tens of millions of thrilled spectators up and down the eastern seaboard stretching from Maine to the Carolinas as a result of crystal clear skies and the night time liftoff. The LADEE liftoff at 11:27 p.m. EDT marked the first space probe of any kind ever launched beyond Earth orbit from NASA Wallops, as well as being the first planetary science mission ever launched from Wallops. Eventually the spacecraft will fly in a very low equatorial science orbit of about 50 kilometers (31 mi) altitude above the moon that will require considerable fuel to maintain. The science mission duration is approximately 100 days, limited by the amount of maneuvering fuel. The probe is built on a revolutionary ‘modular common spacecraft bus’, or body, that could dramatically cut the cost of exploring space and also be utilized on space probes to explore a wide variety of inviting targets in the solar system. Stay tuned here for continuing LADEE news. Minotaur V rocket and LADEE spacecraft launch trajectory view as should be seen from atop the Empire State Building, NY, on Sept. 6, 2013 at 11:27 p.m. EDT – weather permitting. WALLOPS ISLAND, VA – An unprecedented spectacle is set to light up the skies this Friday night, Sept. 6, courtesy of NASA when America returns to the Moon with the history making nighttime launch of the LADEE lunar orbiter atop a retired and specially converted intercontinental ballistic missile (ICBM) from NASA’s Wallops Island facility on the Virginia shoreline. Blastoff of NASA’s Lunar Atmosphere and Dust Environment Explorer (LADEE) Observatory atop the maiden flight of the powerful new Minotaur V rocket is slated for 11:27 p.m. EDT Sept. 6 from Launch Pad 0B along the Eastern Shore of Virginia at NASA Wallops. Because it’s at night and lifting off from the most densely populated region of the United States, the flames spewing from the tail of Minotaur could be visible to tens of millions of distant spectators – weather permitting – who have never before witnessed such a rocket launch. So you don’t have to be watching locally to join in the fun and excitement. And you can always watch the NASA TV webcast online on a smartphone or laptop. 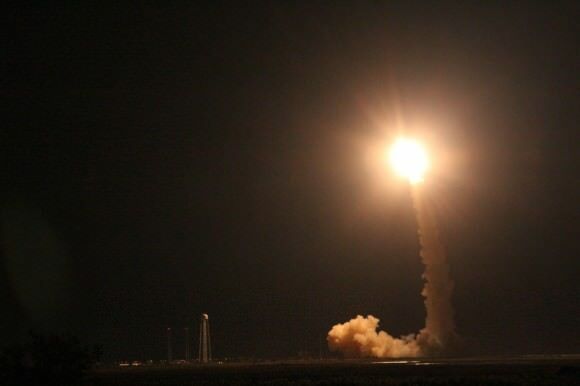 The LADEE (pronounced ‘laddie’ not ‘lady’) launch is historic in many ways. No space satellite has ever been launched to beyond Earth orbit from NASA’s Wallops’s launch base in Virginia, it’s the first flight to the Moon from Wallops, the first Minotaur V rocket launch based on the Peacekeeper missile, and it’s the first flight of the revolutionary new modular spacecraft design aimed at significantly cutting the cost of exploring space. So although the very best views are available from local areas in Virginia, Maryland and Delaware just tens of miles away from the Wallops Island launch pad, magnificent viewing opportunities are available from a broad region up and down the East Coast and into the interior. Let’s look at some viewing maps courtesy of Orbital Sciences, the company responsible for assembling the Minotaur V and integrating it with the LADEE spacecraft – built by NASA’s Ames Research Center. First up is the Maximum elevation map showing how high the rocket will be visible in degrees from the heavily populated US East Coast stretching from Maine to both Carolinas and into the industrial Midwest. Herein are a series of graphics showing the Minotaur V trajectory and what you should see – during firings of the first three stages – from the perspective of standing on the ground or skyscrapers at a variety of popular destinations including the US Capitol, Lincoln Memorial, Kitty Hawk, NC, Atlantic City, NJ, New York City, Cape Cod and more. The five stage Minotaur V rocket stands 80.6 feet (24.6 meters) tall, is 7.6 feet (2.3 m) in diameter and weighs 197,034 pounds (89,373 kilograms. The first three stages of the Minotaur V are based on the nuclear armed Peacekeeper ICBM intercontinental ballistic missile built during the Cold War – now retired and refurbished by Orbital for peaceful uses. It’s literally beating swords into plowshares. The 5th stage is a new addition and what makes this Minotaur a new rocket class. The added thrust is precisely what enables shooting for the Moon. For anyone coming to the Wallops area for an eyewitness view of the launch, NASA worked with local officials to establish several viewing locations just 10 miles or so from the launch pad at the Mid-Atlantic Regional Spaceport, at NASA’s Wallops Flight Facility, Wallops Island, Va. Visitors to the area may view the launch from Robert Reed Park on Chincoteague or Beach Road spanning the area between Chincoteague and Assateague Islands. Both sites will feature a live countdown and broadcast and NASA personnel will be on hand to discuss the LADEE launch and goals of the mission. A big-screen projector will broadcast live in Robert Reed Park beginning at 9:30 p.m. The couch sized 844 pound (383 kg) robotic explorer is equipped with 3 science instruments and a laser technology demonstrator. These include an ultraviolet and visible light spectrometer that will gather detailed information about the composition of the tenuous lunar atmosphere; a neutral mass spectrometer to measure variations in the lunar atmosphere over time; a laser dust experiment that will collect and analyze dust particle samples; and a laser communications experiment that will test the use of lasers in place of radio waves for high speed data communications with Earth. Be sure to watch for my continuing LADEE and Antares launch reports from on site at NASA’s Wallops Launch Pads in sunny Virginia – reporting for Universe Today.